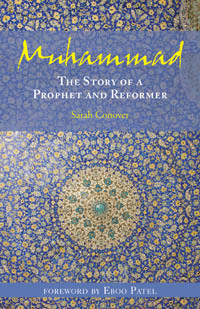 From Sarah Conover comes Muhammad: The Story of a Prophet and Reformer. This biography of the Prophet of Islam for ages 9 and up will inspire and educate readers of all faiths. <>Also available as an eBook in the Amazon Kindle Store and on Google Play. In the pages of Muhammad: The Story of a Prophet and Reformer, young readers will encounter a man very different from the figure often presented in Western popular culture. Drawing from biographies, the Quran, and hadith, Sarah Conover, co-author of Ayat Jamilah: Beautiful Signs: A Treasury of Islamic Wisdom for Children and Parents, relates the story of a radical prophet who challenged the rich and powerful, guided his community of followers through a dangerous time of persecution and exile, formed alliances with people of different beliefs, and preached "love for humanity what you love for yourself." Before he became one of the most venerated, and most misunderstood, religious leaders in history, Muhammad was an orphaned child and a shepherd…. Written for readers 12 and up, and with a foreword by Eboo Patel (founder of Interfaith Youth Core and a member of the President's Council on Faith-Based Neighborhood Partnerships), Muhammad: The Story of a Prophet and Reformer will educate and inspire youth and adults of all faiths. To read the Discussion and Reflection Guide click here. The number of Believers grew by a handful of converts each week. They called themselves Muhammad's Companions. Through the revelations, God was their educator, their Rabb. Muhammad told them, "Seeking knowledge is the duty of every Believer. It will enable you to be your own friend in the desert, it will be your mainstay in solitude, your companion in loneliness, your guide to happiness, your sustainer in misery." Twice a day now, in the morning and in the evening, small groups met in secret for worship. Some walked in groups of two or three into the desert so they would not be seen; some met with Muhammad in the house of a Companion where a new revelation could be memorized and explained. When Mecca slipped out of the sun's grasp and stars freckled the eastern horizon, the first soft knock on a Companion's door opened it just enough to let in a single person at a time. "As-salaam alaykum, peace be upon you," said Ali, entering. He was Muhammad's first cousin and one of the first Companions. "Wa alaykum as-salaam, and with you also," replied the host, smiling-this was the greeting of peace that Gabriel taught Muhammad. The last of a small group arriving for worship, Ali locked the door behind himself. In the wandering light of the courtyard, unseen and unheard from the street, Muhammad's Companions formed lines and knelt on palm mats in order to pray. Muhammad and Khadija needed to be watchful. The revelations would spin the world of the powerful in Mecca upside down. Not only had Muhammad declared a belief in one God-the statues at the Kaaba were nothing more than statues he said-but also the money from religious pilgrims for food, water, and housing while in Mecca kept the large and powerful Quraysh tribe, the guardians of the shrine, very rich. Additionally, Muhammad taught that all people, wealthy or poor, were equal before God, "as equal as the teeth of a comb," he said, and the rich had a duty to share their wealth with the poor. A revelation that would further upset the powerful stated that the oppressed must be freed: Women were men's partners, not property; infant girls must not be killed; slaves must be able to earn their freedom. There aren't many books about Muhammad's life written for youth. Conover (Ayat Jamilah, 2004) has taken on the task, beginning with the prophet's childhood adoption by Bedouins and ending with his arrival in Medina. Along the way, the author details Muhammad's education, his first marriage, the revelation of the Qur'an, and the anger he faced from his community. Throughout, Conover cultivates a strong sense of place with colorful descriptions of the desert setting, and she draws the events, characters, and some dialogue from established biographies of Muhammad, hadith, and the Qur'an. . . . Conover's sensitive, respectful approach is carefully researched, and her emphasis on Muhammad's peaceful, wise nature adds nuance to the all-too-common myopic perceptions of Islam in contemporary culture. . . .
Conover, author of multiple religion books including the prize-winning Ayat Jamilah: Beautiful Signs: A Treasury of Islamic Wisdom for Children and Parents, adds herself to the growing list of biographers of the Prophet Muhammad. Her approach has a twist, though: aiming at teen readers, she adds imaginative, descriptive details and writes narratively—a departure from straightforward exposition. Conover makes an effort to include accurate sayings and customs (hadith) of Muhammad, interspersed with details of desert life. Stories well known to Muslims, such as how a spider at a cave's mouth saved Muhammad's life, and how Muhammad's camel picked the location of the prophet's Medina house, shore up areas where she took poetic liberties in, for example, dialogue. Carefully separating the facts from the liberties in an appendix, which also includes a time line and glossary, Conover ends her tale with the arrival of Muhammad in Medina, marking the beginning of the Islamic calendar. In her talented hands, Muhammad's story stays rooted in tradition, but takes on new dimensions that all readers, even seasoned ones, will appreciate and enjoy. Ages 12-up. A portrait of Muhammad not as the caricature sometimes viewed in Western culture, but as a man. A great man, yes, but a man who lived and breathed, a man with a childhood. Conover has compiled facts about his life and weaved them into the landscape of Muhammad's Saudi Arabia. "I would like to congratulate Sarah Conover for this beautiful and inspiring book on Prophet Muhammad. Applying her storytelling skills, she has successfully done what every Muslim aspires to see, depict Prophet Muhammad as a human being in real historic terms, neither less nor more, yet project his Prophetic role through his daily activities and interaction with other human beings. People of other faiths will be equally fascinated to know the real man of God, leader, reformer, problem solver, and bridge builder without him being demonized or misrepresented by those who are biased or who want to justify their own agendas. I am glad to see that the author sought the guidance of knowledgeable Muslims in seeking accuracy, and the book has been reviewed by scholars and educators who are respected in our community. I recommend this book to all those who are honestly struggling against bigotry and ignorance. This is a useful tool in the hands of truth seekers and peacemakers. We are thankful to Sarah Conover for this great gift." "I was told the target audience of this book is young people, and so I started reading it with two sets of eyes: the eyes of a Muslim father who is constantly on the lookout for material that will give my young boys a deeper understanding of their faith and the eyes of an interfaith leader . . . . Both sets of eyes found much to love and admire here . . . . Like the best books meant for young adults, there is much here for those who are older and fancy themselves wiser." "This book is uniquely precious and timely. Filled with grace and beauty, this highly engaging story will stimulate minds and open hearts." "I recommend this book to all those who are honestly struggling against bigotry and ignorance. This is a useful tool in the hands of truth seekers and peace makers."